Committed to your well-being and that of the planet, Kudadoo Maldives reinvents sustainability thanks to an integrated solar system powering the resort. 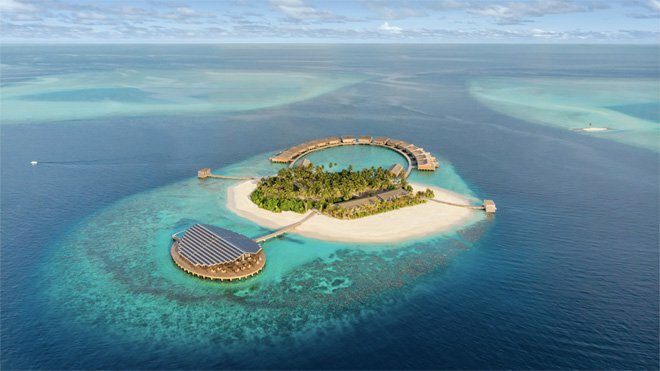 The recently opened Kudadoo Maldives Private Island by Hurawalhi is not just Luxury Travel Intelligence’s best new luxury hotel for 2018 but also an ecologically sustainable solar-powered luxury resort. In designing Kudaloo Maldives, Yuji Yamazaki Architecture made an oft hidden eco-friendly feature the central design element of the luxury resort. 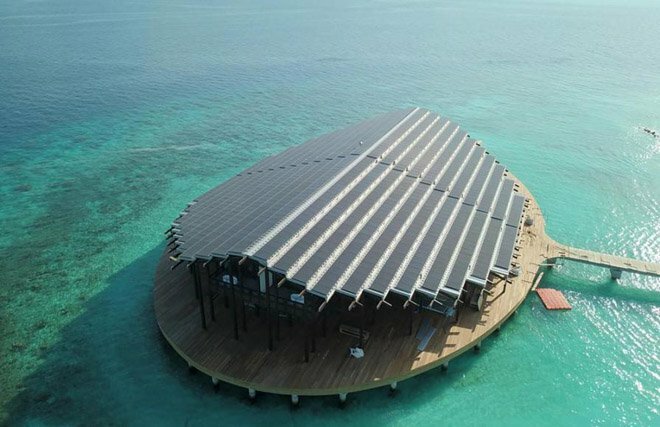 Indeed, the architects incorporated the solar panels into an impressive photovoltaic roof onto the main building of Kudadoo Maldives resort. Designed by New York-based architectural firm Yuji Yamazaki Architecture, Kudadoo Maldives is a private island situated in the Lhaviani Atoll, embracing all the hallmarks of luxurious living without compromise the lifestyle accoutrements of high net worth escapism while simultaneously and ingeniously incorporating benchmark standards of sustainability, thus creating an environment that is holistic for mind, body and soul. The collection of 15 overwater villas is a place where your heart desires are fulfilled seamlessly, authentically and in sync with nature. 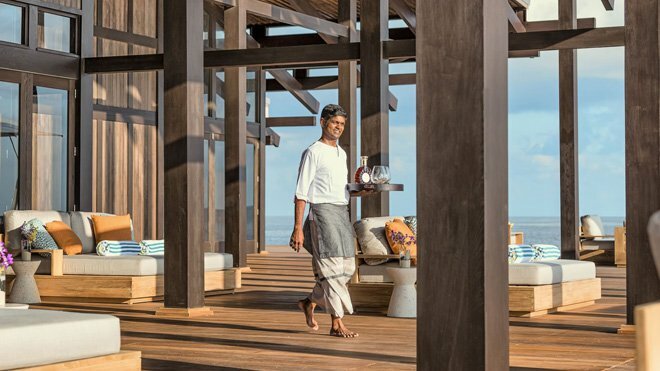 With a dedicated butler on hand to help you tailor all aspects of your time at Kudadoo Maldives, moments of magnificence await you at every turn thanks to the sustainable luxury resort’s AAA concept – Anything. Anytime. Anywhere. 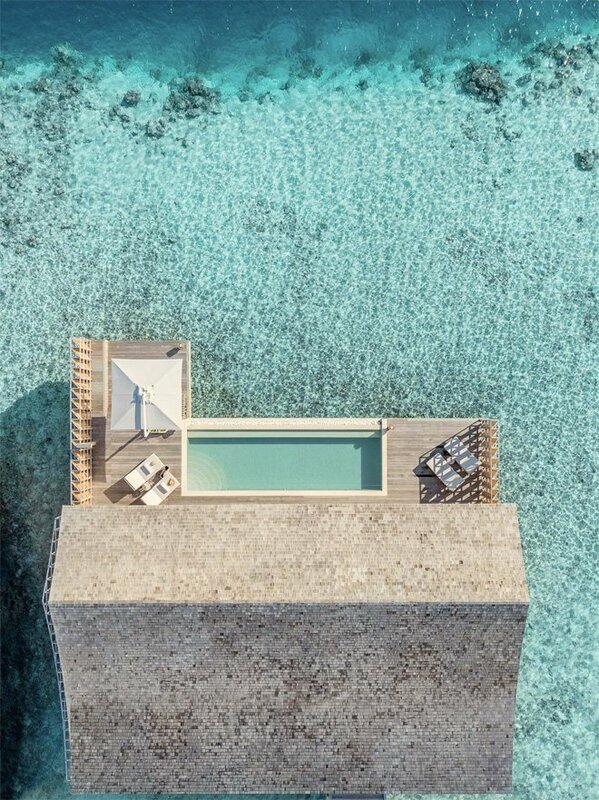 – encompassing all facets of your holiday; from personalised culinary creations to ocean exploration and of course, par course for all resort-living, body spas and wellness, all are yours to be had against a marvellous backdrop of the Maldives’ Lhaviyani Atoll. The Kudadoo residences are emphatically spacious, even the one-bedroom villas enjoys 303 square metres of space while the two-bedroom residences tips the scales at 380 square metres; each featuring a private deck for one to luxuriate upon hanging sofa and sun loungers or simply to enjoy a leisurely soak in an infinity pool facing the ocean. As with most upscale Maldivian luxury resorts, the villas incorporate an exquisite glass floor for guests to peer at the serene sealife in the dining areas of their residence. Committed to your personal well-being and that of the planet, Kudadoo reinvents sustainability thanks to the integrated solar panels, a 320-kWp (kW peak) renewable energy system that generates enough to power the entire three-hectare (7.4-ac) island retreat without the need for external sources. 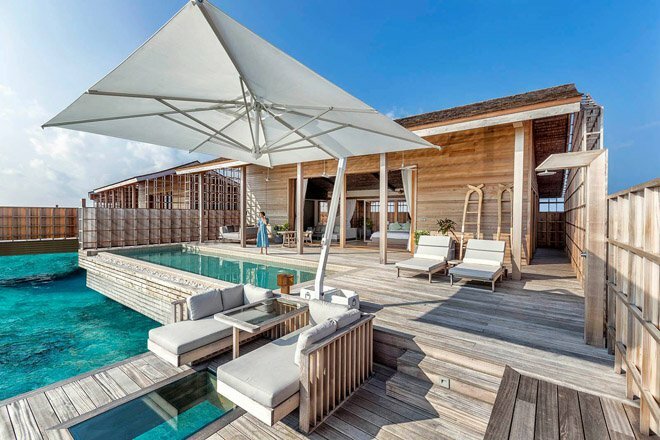 Furthermore, all the wood structures on the private Maldives island are constructed using sustainable wood sources from a myriad of forested locales including Indonesia, New Zealand and Canada. Kudadoo Maldives includes dining establishments – buffet restaurant Canneli, and Aquarium restaurant – teppanyaki grill and bar; spa, main freshwater infinity pool, gym and access to a remote, private pleasant beach.